On the auspicious occasion of 20th Earthquake Safety Day, FSCN in support of its project partners organized an interaction program on “DRR&M Act” to the local representatives of 9 wards of Changunaryan Municipality on 19th of January 2018. The program was chaired by Mrs. Bina Bastola, Deputy Mayor of the Municipality and Chair of MDMC. There was participation of Mr. Som Prasad Mishra, Mayor of Changunarayan as a chief guest and Mr. Surya Bahadur Thapa, Chairman of FSCN as a special guest. Representatives including ward chairs of 9 wards were oriented on the provisions of DRR&M Act specially focusing the provisions defined for the local level institutions for DRR and DM. Mr. Bishnu Timilsina, an advocate and legal adviser of FSCN presented on Act. The orientation program helped to understand the responsibility of not only government institutions but also of private sectors and the individual person for DRR and DM. Deputy mayor also expressed her commitment to internalize the DRR measures while developing and implementing municipal development plans. FSCN chairman also highlighted the role of local representatives on DRR. After the DRR&M Act orientation, a short presentation was made highlighting role of private sectors on DRR. As Changunarayan is rich in its cultural heritages and touristic place, there are lots of private sectors who are growing their business in Changunarayan. Private sectors such as NNTDC, Home-stays, Brick Manufactures, Cooperatives and Private Schools are major private stakeholders of Changunarayan who can contribute in DRR and DM. With the aim of sensitizing their role on DRR, private sectors were invited in the program. Though there was not much participation from hotel sectors, other private sectors who participated in the program got information about their role mentioned in the new DRR&M Act. 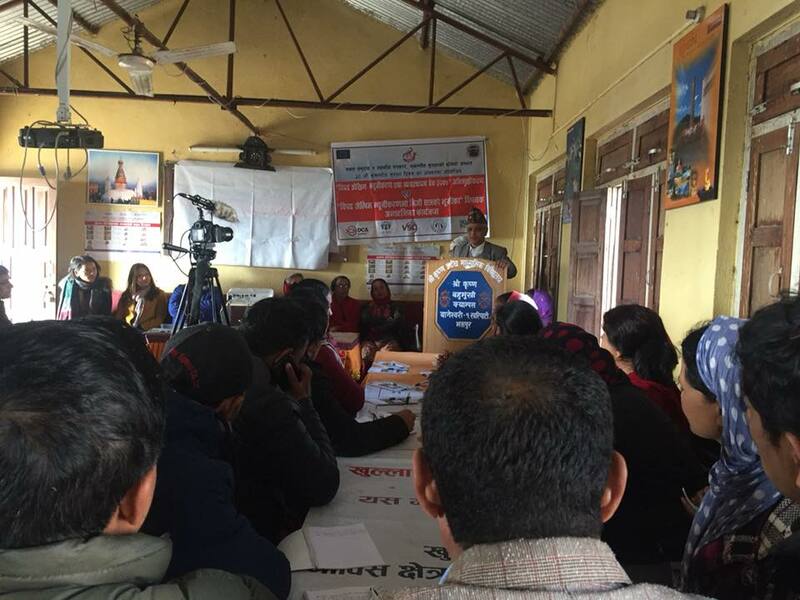 It is remarkable that PRAGATI project is funded by ECHO and executed by the consortium of DCA, ADRA Nepal and VSO.